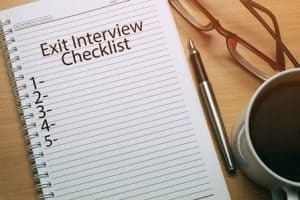 Exit interviews allow companies to gain key insights on how to boost engagement, encourage teamwork and help the business run more smoothly – if employers take advantage of the opportunity. What made you start looking for a new job? Unlike “Why are you leaving?” this question specifically focuses on your company – not on the employee’s dreams of the future. How did the job match your expectations? Mismatches between candidate expectations and job realities are a key cause of turnover. Gather the specifics here to improve the accuracy of this match – and the longevity of your hires. Did you have the tools and resources you needed to do your job effectively? Stress, according to some researchers, is the human reaction to a situation in which a task’s demands outweigh the resources available to complete it. Reduce stress to boost engagement and productivity by finding out where the “gaps” are and investing in their fulfillment. Don’t ask questions about specific people, issues, or conflicts. Avoid discussing anyone’s current performance or status with the departing employee. This can make it look as if you are setting someone up to be fired – and it distracts from the purpose of the exit interview, as well as wastes time that could be used more productively. Withhold your own opinions about people, issues or conflicts – especially if they could in any way be understood as contributing to office gossip. Gathering useful information from an exit interview is a necessary first step – but that information has limited use unless you put it to work in your overall recruiting and retention strategy. To do this, talk to your staffing partner. Your staffing firm can help you translate an employee’s comments into a to-do list that is focused on improving your hiring, while staying within your budget. At TERRA, we can help you create a comprehensive staffing strategy that gets results. Contact us today to learn more about our recruiting services in Phoenix, Seattle and Portland.